Aiming for a “Harmonized Society with Nature,” the HCM Group sets out its Hitachi Action Guidelines for Environmental Conservation for the preservation of ecosystems. Detailed activity content is undertaken based on the “Hitachi Group Ecosystems Preservation Guideline“. Corporations are completely dependent on bounty and services provided by ecosystems, such as supplies of paper and water, as well as adjustments in quality and amounts of air, water and earth. At HCM we believe that we can contribute to ecosystem preservation from the dual angles of “business” and “contributions to community nature conservation activities” for the preservation and restoration of these ecosystem services. In more detail, this refers to business contributions such as promoting design and manufacturing process improvements that reduce the burden on the ecosystem posed by the product across its lifecycle (raw material procurement, manufacturing, transport, use, collection/recycling and appropriate processing). At the same time we provide products and services that contribute directly to ecosystem preservation, such as water and air purifiers. We consider chemical substance management to be a part of ecosystem conservation, and are continuing our efforts in appropriate management. Our contributions to community nature conservation activities include promoting activities that link to ecosystem preservation such as afforestation and ecological surveys of rare species as part of employee volunteering. HCM is proactively engaged in the “The Nijyu-maru Declaration” in order to help protect biodiversity. The “The Nijyu-maru Declaration” is a program conceived by the International Union for the Conservation of Nature – Japan (IUCN-J) whereby activities designed to stop the loss of biodiversity under the “The Nijyu-maru Project” are declared (as registered activities) by program participants. For the “The Nijyu-maru Project”, entities such as companies and local governments register declarations of what they can do in order to work towards the “Aichi Targets” which was an outcome of the 10th Parties Conference (COP10) convention on Biological Diversity. 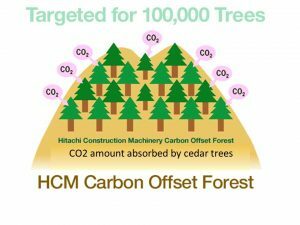 HCM Group agrees with this approach and has registered and declared (the Hitachi Construction Machinery Eco-School Activity) to undertake 1 and 17 of the 20 Aichi targets. This action is a first for the HCM Group and a first for the construction machinery industry. Of group companies within Japan, Tadakiko registered and declared for targets 1, 5, 7, 14, and 17, and Hitachi Construction Machinery Tierra received the same for targets 1, 4, 5, 7, 9, 10, 15, and 17. 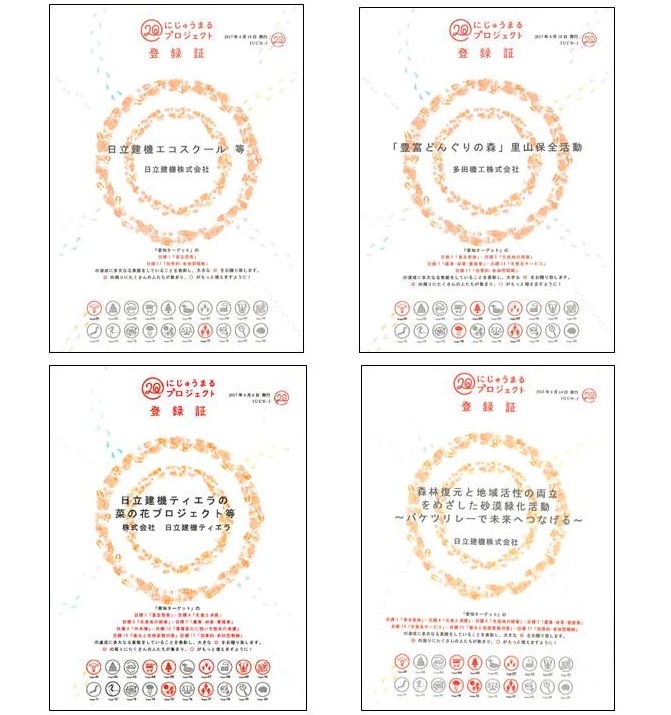 Also we declared for targets 1, 4, 5, 7, 14, 15, and 17 regarding to initiatives of Hitachi Construction Machinery (Shanghai) and Hitachi Construction Machinery (China). This corporation will continue to consider ecosystems and promote conservation initiatives in the future. Biodiversity is faced with four types of crisis. We are providing support through our products and through employee participation in order for the HCM Group to respond to these crises. As a response to the first crisis in particular, the company began the first 10 -year plan for assistance to developing countries in 2005. In addition, the second 10 -year plan that began in 2015 has agreement from 26 dealer companies in which greening activities are undertaken in collaboration with each other. Removal of foreign species such as black bass etc.